Today, we have found deals on Flipkart on smart TVs, which are starting from Rs 16,999. Today, the platform is offering up to a 50% off on smart TVs along with a 5% additional cashback on select bank debit/credit card. If you are looking for a smart TV for your home and have a limited budget, then we’ve got you covered. 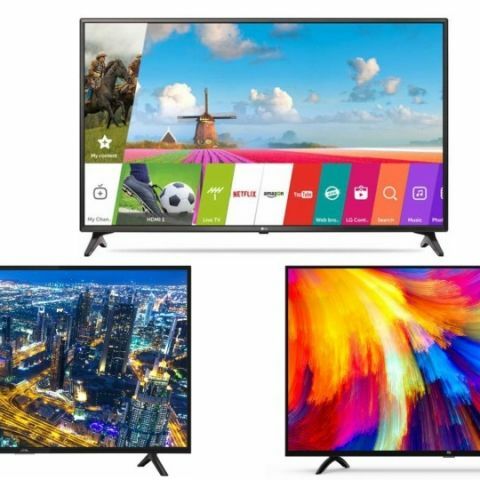 Today, we have found some interesting deals on Flipkart on smart TVs from brands like Vu, LG and more. The iFFALCON F2 40-inch Full HD LED Smart TV offers a resolution of 1920 x 1080 pixels with a panel size of 40-inches. The TV comes with a Micro Dimming function that automatically adjusts the brightness and darkness of the scene by analyzing the nature of the content. It also has a built-in stereo speaker that comes with Dolby surround sound audio. It has built-in Wi-Fi that lets you connect the TV to your home network and download apps like Hotstar, Youtube and more. Click here to buy. The Mi 43-inch LED Smart TV 4A features a full HD LED display, which offers a resolution of 1920 x 1080 pixels. The TV has a 64-bit quad-core processor, which is paired with a 1GB RAM and 8GB storage. It also has a screen-mirroring feature that lets you watch the content of your smartphone on a bigger screen. Click here to buy. The Vu Premium Smart 49-inch Full HD LED Smart TV comes with A+ grade panel that eliminates the ambient light reflection to provide clearer pictures on TV. It comes with Premium Smart OS that lets you download a wide range of apps such as Netflix, Youtube and more. Click here to buy. The LG 43-inch Full HD LED Smart TV offers a resolution of 1920 x 1080 pixels. The TV comes with LG content store, which allows you to download a wide range of apps. The TV also has a Miracast feature through which users can watch the content of their mobile phone on a bigger screen. Click here to buy. The TCL 43-inch Full HD LED Smart TV has a built-in Wi-Fi that lets you download a variety of apps for your entertainment such as Netflix, Youtube and more. It has three HDMI ports and two USB ports to connect external devices such as a pen drive, laptop, camera and more. Click here to buy. Can I buy moto e only on flipkart?